Providing 3D and virtual experiences is paramount to attracting buyer interest in the current property landscape. 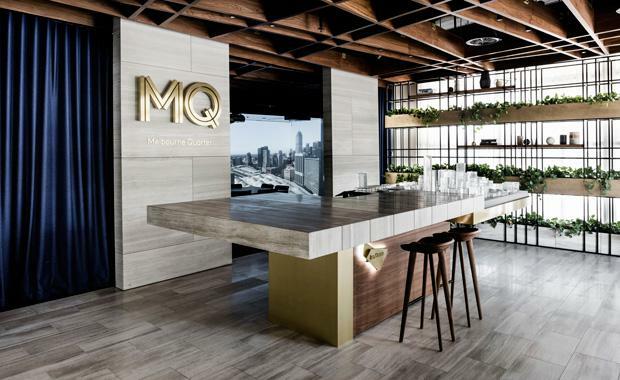 Our team at Technē Architecture and Interior Design has recently designed the marketing suite for Melbourne Quarter, a new major Lendlease development, integrating technological advances to best capture the project design. Melbourne Quarter is a brand-new city block that will bring together world-class design, city living, future workplaces, dining, shops and green spaces. It is expected to be delivered in stages over the next five years. The site is located over the historic Batman’s Hill, directly opposite Southern Cross Station, and will transform this area of the city into a dynamic destination. The design of the suite called for innovative measures from the outset in order to capture the aesthetic and uniqueness of this entire development in just 110 square metres. Not a simple task, given that on completion Melbourne Quarter is expected to accommodate approximately 10,000 workers and over 3,000 residents. The big question – how do we convey the experience of a world-class development (amidst a rapidly changing precinct) while standing on the ground floor of a city site, without a tangible product?This is a common conundrum in the property development industry, but very rarely is it being addressed at a marketing suite level. Our design overcomes these barriers via a 3D immersive experience that encapsulates the development before it has even been constructed. A series of projections display the anticipated views of the future Melbourne Quarter community, replacing the conventionally static four walls of standard marketing suites. Moveable stone walls and curtains within the space provide the flexibility for Lendlease to tailor their customer’s experience. iPads stationed on podiums in the suite allow guests to view Lendlease precinct projects from around the globe and offer a sense of what Melbourne Quarter will accomplish. Quality of design and innovation in modern display suites are increasingly important for developers and architects to communicate the potential experience to the customer. The intention is to create a clear sales journey for each visitor, allowing each person to more accurately envision the experience that Melbourne Quarter will provide. While previously a development could be sold based on a physical suite and the promise of a high-end finished product, today’s buyers are savvier and demand more. The Melbourne Quarter display suite incorporates the highest quality materials to reflect the true nature of the development, its environment and the Lendlease customer. A 2000 square-metre elevated Sky Park will be built over part of Wurundjeri Way and Collins Street as part of the Melbourne Quarter development. [/caption]Contemporary, sophisticated and refined materials such as stone flooring and wall cladding are used throughout to reflect the level of care dedicated to the new precinct. A timber ceiling and feature green wall are a reference to the iconic ‘city grid’ that makes up the Melbourne CBD. This motif of the Melbourne grid and urban construction will be threaded throughout the development. The inclusion of greenery in the suite is a direct reference to the commercial and residential buildings in Melbourne Quarter, which are pursuing a six and five-star Green Star rating respectively, with over half of the precinct designated to green and open public space.